Flying Eye Books | Nobrow is coming to ALA Chicago! 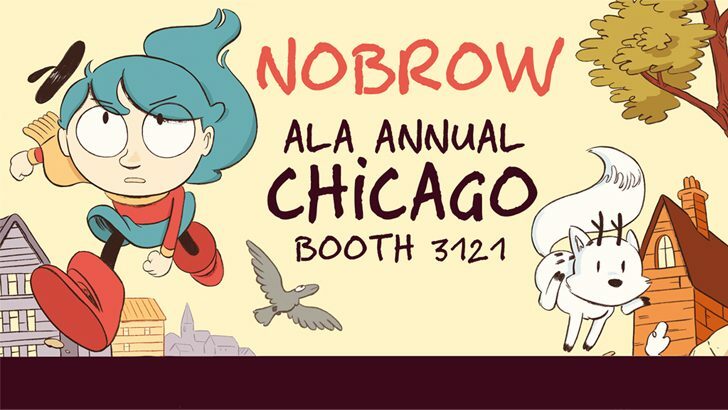 Nobrow is coming to ALA Chicago! Make sure you’re free from June 22nd through June 27th because Nobrow is coming over for this year’s ALA Annual, and we have a feeling this show is going to be a BEAST! We’ll set up our Nobrow HQ at Booth 3121, where you can stop by and check out all of our latest releases, our greatest hits, and maybe even take a peek at some upcoming titles that will be lighting up a bookstore near you later this year. There’s also going to be plenty of awesome giveaways! But that’s not all– not even close! We’re also going to be bringing you the talents of SAM BOSMA (Fantasy Sports series) and JEN LEE (Garbage Night), and we’re teaming up with the French Comics Association to bring over MARGUERITE ABOUET (Akissi) and JÉRÉMIE ROYER (Audubon, On the Wings of the World). That’s FOUR Nobrow artists to see at panels and signings at ALA! Live reading and book signing with Marguerite Abouet, Jérémie Royer, and others! Like we said, between all the fun events, panels, signings, and giveaways, it’s going to be one big BEAST of a show. We hope you can make it! If you want to schedule some time to meet up with us and say hi, send an email over to [email protected]. We can’t wait to see you there!